"Edna Hoffman, Hebron, Indiana, perks up a meal with this old-fashioned layer cake. 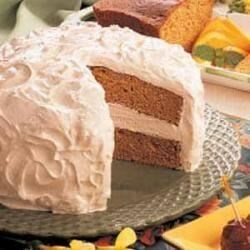 The dense cake is rich in spices, while the frosting is fluffy and sweet." In a large mixing bowl, cream butter and brown sugar. Beat in the egg yolks and vanilla. Combine the dry ingredients; add to creamed mixture alternately with sour cream. In a small mixing bowl, beat egg whites until stiff; gently fold into batter. Pour into two greased and floured 9-in. round baking pans. Bake at 350 degrees F for 25-30 minutes or until a toothpick inserted near the center comes out clean. Cool for 10 minutes before removing from pans to wire racks. For frosting, in a heavy saucepan, bring brown sugar and water to a boil. Boil for 3-4 minutes or until a candy thermometer reads 242 degrees F (firm-ball stage). In a mixing bowl, beat egg whites and cream of tartar until foamy. Gradually add hot sugar mixture; beat on high for 7 minutes or until stiff peaks form. Add vanilla; continue beating until frosting reaches desired consistency, about 2 minutes. Spread between layers and over top and sides of cake. Refrigerate leftovers. I do not recommend this recipe. Calls for way too much cloves and causes a bad after taste. Great cake! To make a festive desert for Christmas, I improvised and whipped up a cream cheese frosting with eggnog and nutmeg in it. It was well-received and delicious! We thought this cake was delicious! I didn't make the frosting here and instead used a cream cheese frosting recipe. Made this for my sister's hubby's birthday with cream cheese frosting. This cake was moist, and so yummy! They both asked if they had to wait another year for another one. Thanks for a keeper!